Republican presidential candidate Donald Trump votes in Midtown gym at PS 59 between Second and Third avenues. MANHATTAN — These are distressing and depressing times for many New York parents. While most parents would be proud to have their children be aware of the world around them, it has been difficult for many to explain the issues raised by President-elect Donald Trump, including his comments on sexually assaulting women along with disparaging remarks about immigrants, Muslims, Mexicans, and people with disabilities. 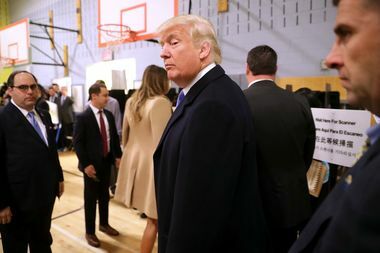 Although 18 percent of voters in NYC cast their ballots for Trump, his rhetoric alarmed even some members of Trump's own party — many of whom distanced themselves from him until late in his campaign. According to the 2016 "Stress in America" study by The American Psychological Association, more than half of 3,255 people surveyed across the nation — of both political parties — said the election was "a very or somewhat significant” source of stress in their lives. Windsor Terrace mom Lisa Hamilton had been reluctant to allow her 10-year-old son to watch the presidential debates. They watched the first hour of the final debate together. The next night her son — who is typically easy-going and happy and feels very safe in his neighborhood — had a nightmare about people out in the street, testing out torture machines on passersby and taking notes on clipboards. “He was afraid to go back to sleep because he was next,” Hamilton recounted. On Wednesday morning, after Trump's presidential win, Hamilton sat down with her son and tried to "empower him to be good and kind and brave just like I do everyday," she said. "One man, one election is not going to ruin my child's day or break his spirit — or make him hateful or neurotic. That's not who we are." He did, however, think that Trump's term started immediately, so Hamilton explained that he wouldn't start until Jan. 20. "Mostly I did the mindful today thing," she said. "Today is all we are promised and today my president is Barack Hussein Obama." Talking with her distraught daughter, a college freshman who cast her first presidential vote, however, proved more challenging, Hamilton admitted. Here are some tips for parents on how to speak to your kids about the new president. 1. Help kids cope by managing your own anxiety. Remember the rule of the airplane oxygen mask — take care of yourself first — advised Scott Woodruff, psychologist at the American Institute for Cognitive Therapy on East 57th Street. "There are two main things for parents to do: One is to help their children cope and the other is to model effective coping themselves," he suggested. "Keep from losing your temper or getting lost in catastrophic thoughts or unproductive worries." Be sure to offer comfort and perspective. "If a child is angry, confused, disappointed, or anxious, tell him or her that their feelings make sense," Woodruff said. "At the same time, do your best to provide perspective: This is far from the first time that the United States has struggled with prejudice and polarized viewpoints. "Focus on the things that they and you can do to inspire changes consistent with values," he said. "Maybe that is becoming active with a like-minded organization, maybe it is standing up for someone who is different. And do the same yourself." Something that might be awful and scary can also be extremely unlikely, he added. “Parents have to realize that they are the gods and goddesses to their children,” said Anna Balas, a child and adolescent psychiatrist on the Upper East Side, who is a member of the New York Psychoanalytic Society and professor at Weill Cornell. 2. Talk with your child. Parents often assume they know what’s on their children’s minds — a stance many experts advise against. “The first thing is not to assume what a child is thinking and feeling,” Woodruff said. In some cases, it might make sense to wait until your child brings up something they’re worried about or ask them open-ended questions, like how have they been talking about the new presidency in school or what have people been talking about, he suggested. It’s also important to understand that your children know what’s happening in the world around them, said Balas. If you assume that your child doesn’t know what’s happening when they do, it will only deepen their sense of isolation, she noted. Responding to your child will change depending on the child’s age. “With younger children, you might want to go straight to reassurance” — and make sure they know that adults will protect them — “with older children, you might want to be more nuanced,” Woodruff said. 3. Use this as an opportunity to talk about inclusion. Before his 16-year-old daughter went off to school Wednesday morning at the famed LaGuarida High School for the Performing Arts, she told her dad, Kevin Dahill-Fuchel, she was expecting it to be a “depressed” place. His hope is that in the longer term, the election results provide an opportunity for “authentic” discussion marginalization. And that has to cut in both directions, he said, whether it’s a teacher from Long Island figuring out how to communicate with her students in the Bronx and vice versa. There could be clashes at schools, he worried, in neighborhoods in Staten Island, for instance, where Trump supports might mix with opponents. 4. Have discussions about the political process and civics. People may now pay more attention to the political process, the limitations of executive power and how laws get passed, Dahill-Fuchel hoped. Many of the changes that Trump proposed on the campaign trail, for instance, like building a wall along the Mexican border, can’t be done unilaterally and without a huge budget from Congress. It’s also an opening for children to learn how to develop arguments, Dahill-Fuchel said. “How do we get into a conversation with somebody [and figure out] how we can become persuasive,” he said. 5. Turn off the television and step away from the social media for a while. Keeping the television off can help, said Balas, saying that kids are highly sensitive to media and can get secondary trauma, as happened in the case of many people who watched the endless stream of video of the planes crashing into the World Trade Center on Sept. 11, 2001, even though they were nowhere near the crash. “Control the flow of information and dialogue,” Balas added, saying it's a good idea to keep teens' social media in check as well. Instead focus on gathering information in a controlled manner, she said, and check in with your kids to make sure they're absorbing it in context.